Adolf Hitler and Benito Mussolini sign “Pact of Steel” forming the Axis powers. British cipher experts at Bletchley Park break the Luftwaffe Enigma code. 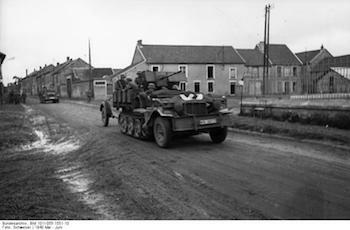 The XIX Panzerkorps (Guderian) strikes from Abbeville toward Boulogne, Calais and Dunkirk along the Channel coast. Himmler establishes Norwegian SS on German lines. British blockade of Vichy France made complete. Heavy German air attacks on Crete sink the cruisers Fiji, Gloucester and the destroyer Greyhound. The Battleships Warspite and Valiant are damaged, but the Royal Navy breaks up German supply convoy. Fierce fighting continues as British troops begin to pull back from Maleme airfield towards Suda Bay in order to regroup and protect their main point of supply. British forces capture the last Italian stronghold in southern Abyssinia. The 6th Army and Kleist’s Panzer’s meets thereby pinching of the Russian salient Southeast of Kharkov. Mexico declares war on Germany, Japan, and Italy after many ships are lost to German U-boats. United Steel Workers of America is formed, combining smaller unions. German Gen. Adolf Galland flies Me 262 jet fighter, presses for its development. Allied forces breached the Hitler Line in central Italy. Canadian troops in the Liri Valley took Pontecorvo. German submarine U-476 was depth charged and damaged off Trondheim by a PBY Catalina of No. 210 Squadron RAF. She was scuttled the next day by U-990, which rescued the survivors. German submarine U-675 was depth charged and sunk off Ålesund by a Short Sunderland patrol bomber of No. 4 Squadron RAF. Montgomery is appointed as C-in-C of the British force of occupation in Germany and a British member of the allied control commission. ‘Sugar Loaf Hill’ on Okinawa is finally taken by U.S. troops after changing hands 11 times in the last few days. Due to continuing shortages, Britain cuts rations of fats, bacon, meat, and soap.